In the Americas you’ll hear the words ciudad (“city”), cereza (“cherry”), and zorro (“fox”) pronounced as “see-oo-DAHD” [sjuˈðað], “say-RAY-sah” [seˈɾe.sa], and “SOE-rroe” [ˈso.ro]. However, in Spain, you’ll pick up on something a bit different—“thee-oo-DAHD” [θjuˈðað], “thay-RAY-thah” [θeˈɾe.θa], and “THOE-rroe” [ˈθo.ro]. This is because in most of Spain, instead of using the “S” sound /s/ for C when it comes before E or I and for Z, they use the “TH” sound /θ/ as in the English word “thin.” It’s a really long story as to why they do it that way, but it’s safe to say this dialect feature is neither a lisp (since they still can make the “S” sound, see #3), nor an imitation of some medieval king’s speech impediment. I think this is probably my favorite thing about the Castilian accent because it’s just so fun to say. For the “KH” sound /χ/, visualize a huge loogie in the back of your throat that you get when you have a bad cold, and now imagine the sound you make when you inevitably have to HACK it up (into the sink, please and thank you). That right there is the sound you’re looking for. In theory, the Spanish sound /x/ found in words like jamón (“ham”), judío (“Jew”), and gemela (“twin”) is similar to the sound represented by CH in German (e.g., Ich Bach) and Scottish Gaelic (e.g., loch “lake”). Or, a cat hiss. In the Americas, it’s often simplified to a simple, breathy “H” sound /h/, but in Spain, this sound is pushed much further back in the throat to a loud and salivary “KH” sound. Thus, “khah-MOEN” [χaˈmon] instead of “hah-MOEN” [haˈmon]. Now I know what you’re thinking, how could you possibly pronounce S any other way? Well, I’ll tell you. In the majority of Spain, they use a sound that is ever-so-slightly whistle-ly, about halfway between the English “S” /s/ and “SH” /ʃ/ ones. Think of a stereotypical old-time Southern accent, or the way Ian McKellan says, “Bilbo, the ring is still in your pockets” in The Fellowship of the Ring. This is a very subtle, small difference but it is crucial for sounding Spanish. There’s a lot of variation in the way the S is whistled—Prime Minister Rajoy has a very thick, SH-like S, whereas others I’ve heard have a crisp, icy S—so just start playing around with it to see what sticks. I feel like this is supposed to be a recent phenomenon, but more and more Spanish people are pronouncing their CHs something like a “TS” sound. I know it’s hard for some English speakers to make this sound, at least at the beginning of words, but think of the last two consonants in the words “pits” or “it’s” and there you go. So the word coche (“car”) or the place-name Chamartín are a little bit like “KOE-tsay” [ˈko.tse] and “tsah-mahr-TEEN” [tsa.marˈtin]. If #4 is something that has recently come into fashion, then #5 is slowly disappearing from the peninsula. We don’t have this sound in English, except for the way some people say the two Ls in the word “million.” This same sound—the “LL” sound /ʎ/—is also found in Italian words like imbroglio (“a mess”) and aglio (“garlic”). When learning Spanish, most of us were probably taught to say words like ella (“she”) and calle (“street”) like “AY-yah” [ˈe.ja] and “CAH-yay” [ˈka.je]. But, at the very least, in the northern half of the country they say those words more like “AY-lya” [ˈe.ʎa] and “CAH-lyay” [ˈka.ʎe]. Instead of merging it with the Y, as many other Spanish dialects do, the typical “standard” dialect in Spain keeps the LL distinct, making it sound like an L that’s been squished up against the roof of your mouth sound. In addition, Spaniards seem all too happy to trill their Rs even when unnecessary, like at the ends of words. Verbs like correr (“run”), lavar (“wash”), and decir (“say”) might sound like correRRR, lavaRRR, and deciRRR in Spain, while words like calor (“heat”) could be pronounced like caloRRR. Don’t forget that in the Andalusian accent they completely chop off Ds and Rs at the ends of words…¡no pasa ná! If you’re traveling or living in Spain for any amount of time you do not have to adapt your accent to this list. 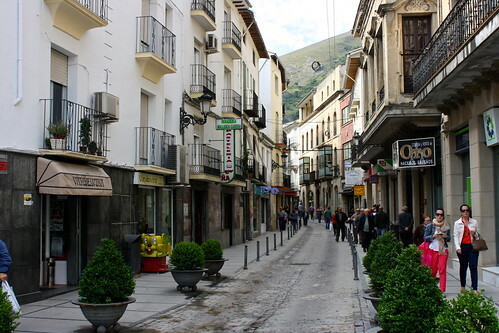 But if you do want to sound more Spanish—if it’s your personal goal to integrate to the Castilian accent—then go all the way and ask for a thay-RAY-thah at the bar, directions to the ah-TOE-tsah train station in Madrid, or what the village’s best shay-MAH-nah SHAN-tah float is. How have you tried to get a better Castilian Spanish accent? Or do you even care at all about assimilating to the Spanish dialect? Talk about it in the comments below!